At the end of March our County Ensemble Lancashire Youth Brass Band returned from their 4th annual residential at Borwick Hall, near Carnforth. The band members enjoy spending the weekend at Borwick for a residential, as it always gives them to opportunity to have a weekend away with their brass playing friends. Residential’s are a great opportunity for team building, socialising, and having the chance to focus on some new repertoire. The main pieces the band worked on were Queen’s famous Bohemian Rhapsody, The Greatest Showman soundtrack, and John Miles’ Music. 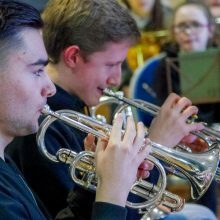 The band also had two soloists playing with the band; Alex Boyes who played Concierto De Aranjuez on the cornet, and Jasmine Templeman who played Teddy Bear’s Picnic on the tuba. The band were also delighted to welcome special guests over the weekend, a team of players from the Kings Division Band, who led sectional rehearsals, and gave a quintet performance and presentation about life as a musician in the Armed Forces, which the players thoroughly enjoyed. The highlight of the weekend was an exciting informal concert for parents, which was enjoyed by everyone. LYBB are now looking forward to our next trip – a concert tour to Ayrshire, Scotland, from 24th – 28th May! To find out more about LYBB and how you can get involved visit their Make Music page here.